Discussion in 'RGB Lights - Intelligent Pixels and 3-Channel RGB' started by jediknight2, Oct 9, 2013. Unfortunatelly, this happens often when some wrong voltages or ground feedback on the RS422/485 chain (DMX ). You can just replace it by an SN75176 or MAX 487. 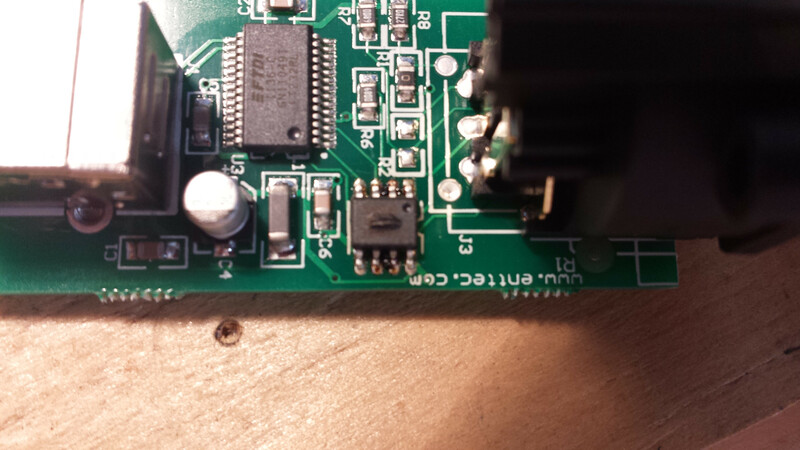 In most of the boards, this chip was on socket and not soldered due to replacement purposes. The cost of this component is less than $1. If urgent, check the ref on your board if still present and go to www.mouser.com. Just went out and did a continuity test on the line. I put one end of the multimeter on DMX+ and touched it to the opposite end that goes into the controller. I get a tone. I then placed the prong on the positive voltage on one end and the DMX+ end that goes into the controller....nothing. I have a Renard48LSD running on 12V daisy chained to a Renard SS24 connected to a USB. The OpenDMX which got fried. Everything is plugged into one 6 outlet timer plugged into one outlet. NOW..my computer is plugged into a different outlet controlled by a different breaker. Disconnect you Enttec device and replace the burned driver. Don't insist here as regarding your circuit, you can dammage also your ftdi chip. The rain PB creating periodic shorcuts and not permanent are quite hard to find. you need to control all chain connection. I am going to order another DMX controller and toss this one as it looks like more trouble than its worth to fix. I will call Enttec tomorrow just out of curiosity for repair. I will also go through every connection before applying power back. It is possible that something is poking through some shrink wrap. The only direct water ingress I have is at the end of the line, That was taped up and when I took the tape off it was bone dry. I am using 4 prong pigtails so everything SHOULD be water tight. I will unwrap everything though and add a piece of tape over every heat shrink solder just for extra measure......I just hope I didn't fry every one of my floods...too late to get something from Ray now. The logic wants you have a problem on your DMX line only due to a major issue in one of your DMX device. For the pixels, etc... They are under management of other circuits/outputs logic with drivers protected normally by a fuse in your third party devices. Means if you have a shot circuit somewhere on your lights chain, one output canl be faulty and normally cannot affect your main dial through DMX devices and the full display. Here I suspect more one of your DMX devices, other than the Enttec as source of the problem. This is why I made our USB-485 converters with isolation. You can still damage a 485 chip, but at least you won't fry your PC. question...had i been using a e6804 to control the dmx data here....would it have just blown a fuse? Most likely the result would have been a dead E6804 board, or at least the 485 chip on it.